Indian economy has some major differences to the world economy as it is still in the developing stage. Therefore, certain differences arise in the accounting procedures as well. On 25th February 2011, the Ministry of Corporate Affairs notified 35 Accounting Standards that have been synced with IFRS. This convergence of IFRS with Indian Accounting Standards is popularly known as Ind-AS. The Ind-AS is similar to IFRS, with some sections customized to match the Indian accounting environment. 1. Presentation of Financial Statements – Ind-AS allows only Single Statement approach. 2. Treatment of Foreign Exchange Loss – Unrealized exchange differences arising on translation of long-term monetary assets and liabilities can be recognized either in Equity or in Profit and Loss A/c. 3. Classification of Expenses – An analysis of expenses recognized in profit or loss should be presented using a classification based only on the nature of the expense. 4. Interest and Dividends – Ind-AS 7 deals with Statement of Cash flows. According to this, interest and dividend paid is classified as Financing Cash Flows and interest and dividend received is classified as Investing Cash Flows. 5. Construction Contracts – Ind-AS 11 deals with Construction Contracts. It states that Revenue shall be recognized on Percent of Completion method, without further evaluation. 6. Government Grants – Ind-AS 20 deals with Accounting for Government Grants. According to this, the Non-Monetary Grants shall be recognized only at their Fair Value. 7. Investment Property – Ind-AS 40 states that investment properties shall be measured using only Cost Model and not Fair Value Model. 8. Disclosure of Earnings per Share – Ind-AS 33 requires all EPS related information to be disclosed both in the Consolidated Financial Statements and Separate Financial Statements. As per MCA, the first set of financial statements under IND-AS standards were to be prepared and filed by companies with a share capital of Rupees Five Hundred crores or more, and their holding, subsidiaries, associates and joint-venture companies. These companies must have prepared their statements for the year ending 31st Mar 2017 with comparatives for the year ending 31st Mar 2016. XBRL is the global standard for exchanging business information. One of its uses is to define and exchange financial information such as financial statements. It provides a common, electronic format for business reporting. 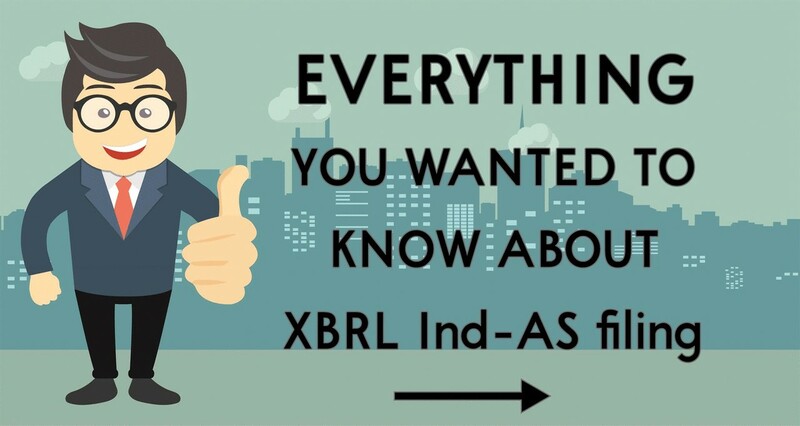 XBRL is based on XML (Extensible Markup Language) which is a standard for the electronic exchange of data between businesses and on the internet. Under XML, identifying tags are applied to items of data so that they can be processed efficiently by computer software. XBRL is a powerful and flexible version of XML which has been defined specifically to meet the requirements of business and financial information. It enables unique identifying tags to be applied to items of financial data, such as ‘net profit’ or ‘liability’. However, these are more than simple identifiers. They provide a range of information about the item, such as whether it is a monetary item, percentage or fraction. XBRL offers major benefits at all stages of business reporting and analysis. The benefits are seen in automation, cost saving, faster, more reliable and more accurate handling of data, improved analysis and in better quality of information and decision-making. MCA has released the final taxonomy & validation tool for filing XBRL as per Ind-AS format. Eligible companies (share capital of Rs. 500 crores or more) will have to file their first set of financial statements prepared as per Ind-AS standards in XBRL format by 31-Mar-2018 for the financial year 2016-17.
iii. The key challenge is the change in the taxonomy itself. Several XBRL software work on the basis of ‘Roll-forward’ that uses prior period XBRL tag to generate subsequent period’s XBRL document. This process will take a hit when taxonomies change as the tags vary. iv. The new taxonomy requires consecutive three year data to be tagged unlike the old taxonomy which require only two years data. This would lead to additional amount of time and effort to incorporate the information. v. The Ind-AS taxonomy requires additional data to be inserted for First Time Adoption of Ind AS, Income Tax data and non-current & current financial assets and liabilities information for both current year and previous year. With major advantages in data collecting and reporting & data consumption and analysis, it is important for companies to make the right choice for XBRL preparation. The choice is to either get it done in-house or using professional out-sourcing services firms. Tools like BeyondSquare XBRL and the Conversion Services provided BeyondSquare conversion desk could help companies face the challenge of first year XBRL IndAS filing. Blog Cash Flows, Credit Risk, expenses., Fair Value, Financial statements, Foreign Currency Risk, Foreign Exchange, Indian Accounting Standards, Interest rate risk, investment properties, Liquidity Risk, validation tool, XBRL, XBRL IndAS filing.